The Anthracite (Dark Grey) range is the latest in the Shop & Roll range from Araven. We have them available in 34L and 55L versions with 4 different coloured handles (Blue, Light Green, Yellow and Red). 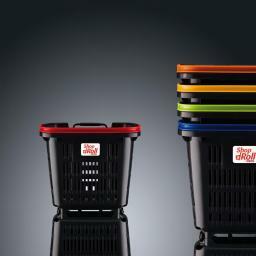 This baskets are made to coordinate with the 100L Loop shopping trolley. Seen more and more on the high street the patented Araven 34 Litre Shop & Roll wheeled basket is one of the most popular. 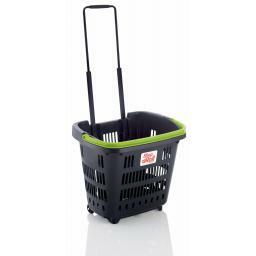 Durable, easy to manoeuvre and keep clean it is a great retailers basket. The anti-bacterial steel telescopic handle is easy to pull and tested to a durability of over 50,000 cycles. These baskets are vertically stackable keeping space to a minimum and there is a stacker for them with a locked castor if required. With two wheels fixed on the long side of the basket it is easy to tilt but sits upright when not in use. - Antibacterial telescopic handle extends to a greater height that others on the market and is more ergonomic. - Handle does not transmit vibrations. - Easy to use even when fully loaded with up 25kg of goods. - Takes up very little aisle space - stacker available if necessary for storage. - Quiet wheel material generates minimal noise while rolling. - Standard handle makes it very easy to pick up at the checkout. All basket only orders are charged a flat carriage rate of £10 + VAT. This covers our basic carriage rate, packing charge (inc materials) and payment processing fee. This relates to all Hand Baskets, Trolley Baskets and Produce Trays. Other UK Islands: please call or email for a shipping quote prior to placing the order. Europe and the Rest of the World: please call or email for a shipping quote prior to placing the order. Alternative colours and branded baskets are available to be manufactured to order. Branding is available on a minimum of 100 units. For a personalised colour or branding quotation please email your requirements and we will respond with full costings and leadtime.